I first met George Selgin almost 30 years ago at NYU where I was a visiting assistant professor in 1981, and he was a graduate student. I used to attend the weekly Austrian colloquium headed by Israel Kirzner, which included Mario Rizzo, Gerry O’Driscoll, and Larry White, and a group of very smart graduate students like George, Roger Koppl, Sandy Ikeda, Allanah Orrison, and others that I am not recalling. Ludwig Lachmann was also visiting NYU for part of the year, and meeting him was a wonderful experience, as he was very encouraging about an early draft of my paper “A Reinterpretation of Classical Monetary Theory,” which I was then struggling to get into publishable form. A few years later, while I was writing my book Free Banking and Monetary Reform, I found out (I can’t remember how, but perhaps through Anna Schwartz who was on George’s doctoral committee) that he was also writing a book on free banking based on his doctoral dissertation. His book, The Theory of Free Banking, came out before mine, and he kindly shared his manuscript with me as I was writing my book. Although we agreed on many things, our conceptions of free banking and our interpretations of monetary history and policy were often not in sync. Despite these differences, I watched with admiration as George developed into a prolific economist with a long and impressive list of publications and accomplishments to his credit. I also admire his willingness to challenge his own beliefs and to revise his views about economic theory and policy when that seems to be called for, for example, recently observing in a post on the Free Banking blog that he no longer describes himself as an Austrian economist, and admires that Austrian bete noire, Milton Friedman, though he has hardly renounced his Hayekian leanings. In one of his periodic postings (“A Question to Market Monetarists“) on the Free Banking blog, George recently discussed NGDP targeting, and raised a question to supporters of nominal GDP targeting, a challenging question to be sure, but a question not posed in a polemical spirit, but out of genuine curiosity. George begins by noting that his previous work in arguing for the price level to vary inversely with factor productivity bears a family resemblance to proposals for NGDP targeting, the difference being whether, in a benchmark case with no change in factor productivity and no change in factor supplies, the price level would be constant or would rise at some specified rate, presumably to overcome nominal rigidities. In NGDP targeting with an upward price trend (Scott Sumner’s proposal) or in NGDP targeting with a stationary price trend (George’s proposal), any productivity increase would correspond to price increases below the underlying price trend and productivity declines would correspond to price increases above underlying the price trend. Here’s how George characterizes the problem. Apart from some die-hard New Classical economists, and the odd Rothbardian, everyone appreciates the difficulty of achieving such downward absolute cuts in nominal wage rates as may be called for to restore employment following an absolute decline in NGDP. Most of us (myself included) will also readily agree that, if equilibrium money wage rates have been increasing at an annual rate of, say, 4 percent (as was approximately true of U.S. average earnings around 2006), then an unexpected decline in that growth rate to another still positive rate can also lead to unemployment. But you don’t have to be a die-hard New Classicist or Rothbardian to also suppose that, so long as equilibrium money wage rates are rising, as they presumably are whenever there is a robust rate of NGDP growth, wage demands should eventually “catch down” to reality, with employees reducing their wage demands, and employers offering smaller raises, until full employment is reestablished. The difficulty of achieving a reduction in the rate of wage increases ought, in short, to be considerably less than that of achieving absolute cuts. U.S. NGDP was restored to its pre-crisis level over two years ago. Since then both its actual and its forecast growth rate have been hovering relatively steadily around 5 percent, or about two percentage points below the pre-crisis rate.The growth rate of U.S. average hourly (money) earnings has, on the other hand, declined persistently and substantially from its boom-era peak of around 4 percent, to a rate of just 1.5 percent. ** At some point, surely, these adjustments should have sufficed to eliminate unemployment in so far as such unemployment might be attributed to a mere lack of spending. How can this be? There have been a number of responses to George. Among them, Scott Sumner, Bill Woolsey and Lars Christensen. 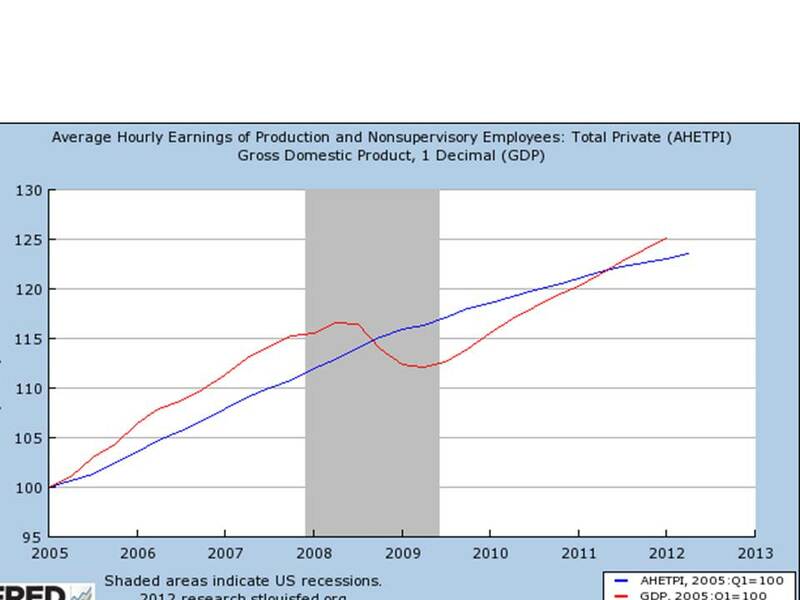 George, himself, offered a response to his own question, in terms of this graph plotting the time path of GDP versus the time path of nominal wages before and since the 2007-09 downturn. However, after some further tinkering, George decided that the appropriate scaling of the graph implied that the relationship between the two time paths was that displayed in the graph below. As a result of that rescaling, George withdrew, or at least qualified, his earlier comment. So, it’s obviously getting complicated. But Marcus Nunes, a terrific blogger and an ingenious graph maker, properly observes that George’s argument should be unaffected by any rescaling of his graph. The important feature of the time path of nominal GDP is that it dipped sharply and then resumed its growth at a somewhat slower rate than before the dip while the time path of nominal wages has continued along its previous trend, with just a gentle flattening of the gradient, but without any dip as occurred in the NGDP time path. The relative position of the two curves on the graph should not matter. By coincidence George’s first post appeared the day before I published my post about W. H. Hutt on Say’s Law and the Keynesian multiplier in which I argued that money-wage adjustments — even very substantial money-wage adjustments — would not necessarily restore full employment. The notion that money-wage adjustments must restore full employment is a mistaken inference from a model in which trading occurs only at equilibrium prices. But that is not the world that we inhabit. Trading takes place at prices that the parties agree on, whether or not those prices are equilibrium prices. The quantity adjustments envisaged by Keynes and also by Hutt in his brilliant interpretation of Say’s Law, can prevent price-and-wage adjustments, even very large price-and-wage adjustments, from restoring a full-employment equilibrium. Hutt thought otherwise, but made no effective argument to prove his case, relying simply on a presumption that market forces will always put everything right in the end. But he was clearly mistaken on that point, as no less an authority that F. A. Hayek, in his 1937 article, “Economics and Knowledge,” clearly understood. For sufficiently large shocks, there is no guarantee that wage-and-price adjustments on their own will restore full employment. In a comment on Scott’s blog, I made the following observation. 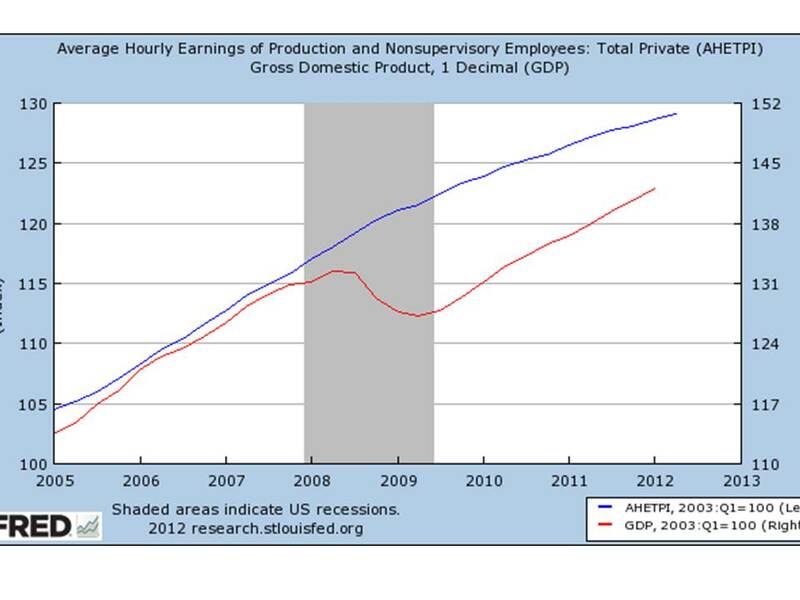 [T]he point [George] raises about the behavior of wages is one that I have also been wondering about. I mentioned it in passing in a recent post on W. H. Hutt and Say’s Law and the Keynesian multiplier. I suggested the possibility that we have settled into something like a pessimistic expectations equilibrium with anemic growth and widespread unemployment that is only very slowly, if at all, trending downwards. To get out of such a pessimistic expectations equilibrium you would need either a drastic downward revision of expected wages or a drastic increase in inflationary expectations sufficient to cause a self-sustaining expansion in output and employment. Just because the level of wages currently seems about right relative to a full employment equilibrium doesn’t mean that level of wages needed to trigger an expansion would not need to be substantially lower than the current level in the transitional period to an optimistic-expectations equilibrium. This is only speculation on my part, but I think it is potentially consistent with the story about inflationary expectations causing the stock market to rise in the current economic climate. The rub, if you ask me, is that of reconciling “pessimistic expectations” with what appears, on the face of things, to be an overly optimistic positioning of expected wages. I am not sure why George thinks there is a problem of reconciliation. As Hayek showed in his 1937 article, a sufficient condition for disequilibrium is that expectations be divergent. If expectations diverge, then the plans constructed on those plans cannot be mutually consistent, so that some, perhaps all, plans will not be executed, and some, possibly all, economic agents will regret some prior decisions that they took. Especially after a large shock, I see no reason to be surprised that expectations diverge or even that, as a group, workers are slower to change expectations than employers. I may have been somewhat imprecise in referring to a “pessimistic-expectations” equilibrium, because what I am thinking of is an inconsistency between the pessimism of entrepreneurs about future prices and the expectations of workers about wages, not a situation in which all agents are equally pessimistic. If everyone were equally pessimistic, economic activity might be at a low level, but we wouldn’t necessarily observe any disappointed buyers or sellers. But what qualifies as disappointment might not be so easy to interpret. But we likely would observe a reduction in output. So a true “pessimistic-expectations” equilibrium is a bit tricky to think about. But in practice, there seems nothing inherently surprising about workers’ expectations of future wages not adjusting downward as rapidly as employers’ expectations do. It may also be the case that it is the workers with relatively pessimistic expectations who are dropping out of the labor force, while those with more optimistic expectations continue to search for employment. I don’t say that the slow recovery poses not difficult issues for advocates of monetary stimulus to address. The situation today is not exactly the same as it was in 1932, but I don’t agree that it can be taken as axiomatic that a market economy will recover from a large shock on its own. It certainly may recover, but it may not. And there is no apodictically true demonstration in the whole corpus of economic or praxeological theory that such a recovery must necessarily occur.